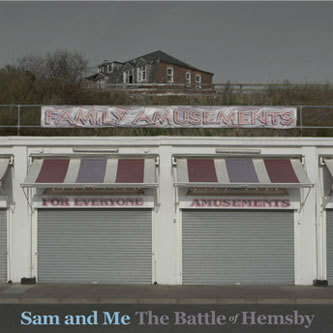 This new album from latest Akoustik Anarkhy signees Sam And Me takes its name from the Norfolk coastal town of Hemsby, where the two friends central to the band (Sam Zindel and Rowan Dawes) would retreat whilst bunking off college. This seaside venue clearly left it's mark on the duo, so much so that the first 500 copies of the CD come packaged with a unique polaroid capturing the town's splendour, plus a chip fork emblazoned with the Sam & Me logo. Now expanded to a quartet, the band centre their arrangements on characterful harmonised vocals, peppering the recordings with subtly deployed brass, strings, pianos, accordions and the odd electronic twitch. Musically this bunch are a tight unit, and despite the broad spectrum of instruments in use the songs themselves are never inflated, and the reined-in mixing style ensures there's a degree of intimacy maintained throughout. 'Green Fingers' is a good example of this, sounding like a lo-fi retake on something from Elliott Smith's XO or Figure 8, while elsewhere you get the Simon & Garfunkel-esque delights of 'London', an insightful piece about the difficulties of juggling day-jobs and big cities with necessarily introverted creative pursuits: "If only time had never learned to fly" they sing. Smashing.